In this episode, guests Joe Turner and Stephen Swisher share their strategic approach to addiction treatment and recovery--one cup of coffee at a time. 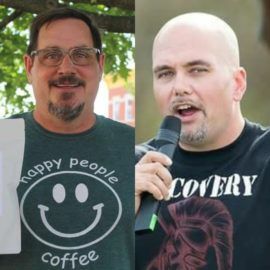 As the owner of Happy People Coffee Company (and a veteran coffee artisan to boot), Stephen Swisher teamed up with the founder of Recovery Champions, Joe Turner, to roll out their Recovery Coffee. Knowing the copious amounts of coffee that are consumed at treatment centers during an average attendee’s time spent in recovery, ... Maggiori informazioni both Joe and Stephen knew they could make a difference by supplying high-quality coffee to each center. They also wanted to provide alternatives for recovering addicts who find themselves consuming sugary drinks and unhealthy foods after the 10:00 AM coffee cut-off time.